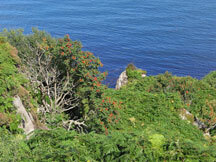 Sometime towards the end of August or early September seems to be the best time to collect the scarlet berries of the rowan. If you pick them too early, you risk the seeds being immature, whilst too late and the birds may have taken them. Collect the bunches directly from the tree by gripping the branch below the bunch and cutting with a pair of sharp secateurs. Take care not to remove next year’s bud! In this way, no damage is caused to the tree. 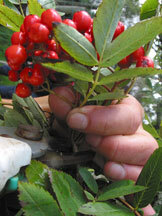 Rowan is not the easiest of the berry fruits to extract seed from, especially if they are under-ripe. Each of the four seeds clings to the inner flesh. Some people recommend leaving the berries to rot for a while, but others think that this will damage some of the seed. This is one fruit to experiment with. 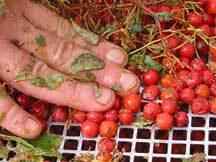 We persevere and extract the traditional way, although we are very gentle with the delicate seeds. You will need a bucket or two, a flat-bottomed pole (for example, an old sawn-off spade handle), a sieve and access to a hosepipe or water supply. The berries are mashed and the waste and seed separated through the sieve. You may find it helps to ‘squash’ the seed through a riddle with your fingers. The riddle must be big enough for the seeds to go through, but small enough to allow the flesh to be crushed. Rowan is simple to germinate despite being difficult to extract. The extracted seed should be mixed with equal parts horticultural sand or a sand/compost mixture (for these seeds the addition of compost to the mixture can help break dormancy). Use 50% leafmould or peat-free compost and 50% horticultural sand. For each handful of seeds add two or three handfuls of mixture. Select a pot that has enough room for this seed/sand mixture (and a bit more) and put a layer of stones in the bottom. Cover the stones with sand. Place the seed/sand mixture on top of this and cover this with 2-3cm sand. Label the pot and stand in a shady spot outdoors. The pot needs to remain outside for the winter. Water the pots if they show signs of drying out and protect from birds and mice if they discover your seeds. Never allow the seeds to dry out, or they may not germinate in the first spring after collection. In March check for signs of germination. If about 10% are growing, they are ready to sow. In a 1-litre pot sow four seeds and cover with no more than 5mm of compost or grit. Firm gently and water. On a seedbed broadcast the seed quite densely – aim for about 5mm between seeds. Firm with a roller or board to press the seed well into the soil. Cover with 5mm of grit. Don’t forget to remove the weaker seedlings to leave the strongest if you are growing them in a container. 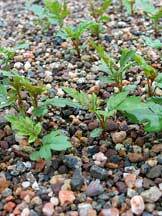 Rowan should germinate and grow well given the right conditions. They should be ready after either the first or second year for planting out. Prepare the site well by clearing away any weeds or grass and make a hole big enough to accommodate the root ball. Plant carefully in the hole, to the same depth as it was previously, and firm back the soil.